Preferred Sites is a new experimental feature for Google Search that lets you personalize the results by adding a list of sites you want to appear more often when you search. Based on your search history, Google suggests some frequently-visited sites, but you can add any other site. The help page explains more: "The preferred sites feature lets you set your Google Web Search preferences so that your search results match your unique tastes and needs. Fill in the sites you rely on the most, and results from your preferred sites will show up more often when they're relevant to your search query." Some use cases for the feature: adding sites you trust for finding a certain kind of information (movie reviews, sports results), adding more obscure sites that aren't likely to appear in the top results (local news sites) and a partial replacement for bookmarks. The feature is an experimental feature that can be found in Google's preferences page if you are logged in and you were selected to test it. Here's what happens when I add GSM Arena and search for [Nokia 6080]: the result from GSM Arena is marked as "My preferred site", but there's no significant ranking change even though Google mentions that "your Preferred Sites were used to improve search results". 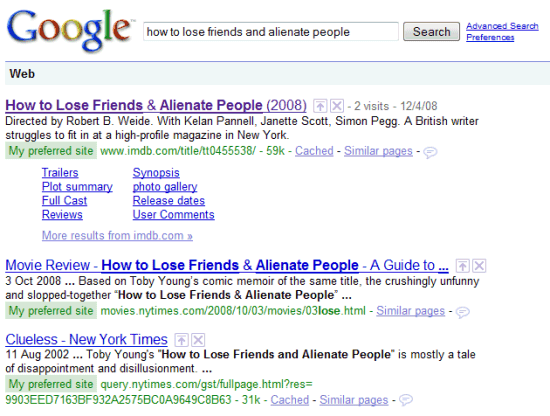 After adding IMDB and New York Times, the results for [how to lose friends and alienate people] were changed dramatically: two pages from nytimes.com were promoted to the top 3 results, but they weren't in the first 30 results for a regular search. Preferred Sites is an extension of Google SearchWiki, the feature that allowed you to make per-query changes. If the feature goes live to everyone, people will be able to pick a list of authoritative sites and influence all search results. I'm now MEGA intrigued by which four sites you have blurred out...! There's something I'd like to see more than this: pages I do NOT want to see. I'm sick of shareware and ringtones. And I'm tired of typing "-shareware -buy -purchase -ringtones -warez" each time I want to search for something! I can't test it. Language is set to English... But I don't have these kind of setting on the preferences page. It isn't the same like the screenshots. Ok it's experimental, but how can I use it? b) when/if it will be publicly launched. b) when/if it will be publicly launched." It already has a use: you search history is searchable. Makes sense to me considering a lot of people seem to use Google search like it's their address bar; typing URLs directly into the search box. Also, it strikes me that it makes sense to have favorite sites built into search, sounds like it might be a reasonable replacement for bookmarks if used often enough. It might make searching a bit easier, but we also like discovering new sites. like get gmail or chrome completely out of beta first. How do I get on the list of users to test this feature? Peter: Chances are that if you don't enter anything into the Preferred Sites Box... It won't do anything. That's called an Opt-In Feature. If you don't screw with it, it won't screw with you. Just wanted to voice my agreement with those who said they wanted to blacklist sites from appearing in the search results. That feature would be far more useful. So, I won't have to type in site:discogs.com every day now? Needless to say I'm excited, let's see this in action! Nice, nice. But when I'm looking for something, I don't know where it is. If I knew, I wouldn't be looking for it. That's true, but you can select a list of sites you trust (e.g. : New York Times, The Huffington Post) and ask Google to promote them in your search results if they include relevant web pages. I think the Firefox extension CustomizeGoogle has the feature to filter out sites from the search results. What about Chrome??? Does anybody have Site Preferences in Chrome Browser? I like the potential of this feature to bring your preferred "authoritative" sources to the top (or at least closer to the top). Yes, it's still great to see ALL results, which allows me to discover new resources, but if results can be qualified, then this feature ultimately saves me. Seems like a great step towards users choosing their own authoritative resources rather than taking what you get based on popularity and search relevance. It might encourage publishers with more authority to invest more in their web content if they knew users could find them and select them as a preferred information source. Could definitely change some SEO strategies, but I think for the better. I've wanted this since I started using Google. I can't wait until it is enabled for me. COME ON GOOGLE! SEND THAT FEATURE! @ Zim : I second that. there are definitely some results i don't want to even bother with - such as a "solution" to a problem on expert-exchange -- that i know I'll have to pay to see anyway. Does this change the global search results or it only changes on your side of the PC? It's a setting saved in your Google account, so it's enabled only when you're logged in. Each user can have a different list of preferred sites and it doesn't affect the non-personalized search results. Hope they bring it back..!! When searching for a keyword, I just noticed on the serps, it's showing blue arrow before the URL on the top 1 of the specific keyword.What does the blue arrow before the URL means? Is it part of preferred sites? This looked like a great feature, why was it killed?